Abst: Placer gold at Rich Hill, Arizona contains trace element distributions which provide a geochemical “fingerprint” that suggests specific lode sources and history for the placer gold. There are three main placer units at Rich Hill (Kamenov et al., 2013): The lower-most “black placers,” the middle “white placers,” and the uppermost “red placers.” In addition, there are remnants of a special fourth unit, called the “potato patch,” which is associated with a paleo-erosional surface. The most prominent geochemical feature of the placer gold is leaching of silver, and enrichment of copper in the outermost rims of gold grains, suggesting long exposure to chemical weathering at the surface. Thickness of these reaction rims increases with increasing distance from the inferred lode source. Gold from the young “red placers” is angular and typical of pulse placers (debris flows), while older “white placer” gold is very rounded suggesting a fluvial environment. Gold from Rich Hill lode deposits have distinctly different lead isotope “fingerprints” from the four placer deposit groups which are more radiogenic. This suggests that the placers formed from a different lode source, or that the gold in the placers has experienced significant geochemical modification. The discovery of gold-metabolizing microbes in biomats within cracks and pits on the “black placer” gold suggests local gold sourcing with subsequent biological remobilization. The “black placer” unit is the stratigraphically oldest, but contains the most radiogenic gold. Placer gold from the La Cholla placers near Quartzsite, Arizona may also form directly within placers but by abiological means. In some locations, this gold occurs as pyritohedron gold crystals up to 1 cm, within a silicified high-energy gravel. It is unlikely that soft gold crystals would survive for long in an environment capable of forming and transporting well-rounded golf ball to softball-sized quartz clasts. Field and geochemical evidence suggest that this gold formed in situ when reducing hot springs associated with a range-front fault flowed through a pre-existing placer gold deposit. These fluids locally dissolved placer gold and later precipitated it as crystals. Lead isotope work on these samples is in progress. Placer gold miners in the 1800s often argued that new gold sometimes “grows” within mined-out placers. These accounts were often discounted out of hand, attributed to inefficiencies of past mining and “tall tales.” However, recent work suggests that placer gold may indeed form in situ by both biological and abiological means. Kamenov, G.D., Melchiorre, E.B., Ricker, F.N., and DeWitt, E., 2013, Insights from Pb isotopes for native gold formation during hypogene and supergene processes at Rich Hill, Arizona: Economic Geology, v. 108, p. 1577-1589. 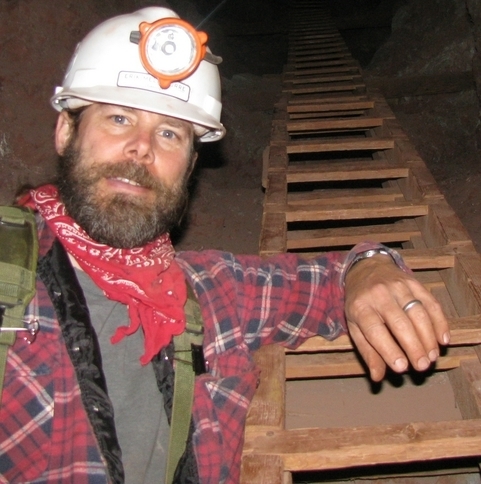 Bio: Erik Melchiorre is Professor of Geology at California State University, San Bernardino, with specialization in stable isotope geochemistry, economic geology, and hydrology. Erik holds a B.S. degree in Geological Science from the University of Southern California, a M.S. degree in Geology from Arizona State University, and a Ph.D. in Earth & Planetary Sciences from Washington University. He has been a guest researcher at Lawrence Livermore National Laboratory in California, and was awarded the SME “Future Leader” award in 2001. He presently serves as chair for the Southern California section of SME. Erik has worked for the Phelps Dodge Morenci and Cyprus Bagdad copper mines in Arizona, and the Sunshine silver mine in Idaho. Erik’s main projects involve geochemistry, including 1) the use of nitrogen and carbon stable isotopes to understand vadose zone copper mineralization 2) geochemical and morphological “fingerprinting” of placer gold to understand placer formation and gold sourcing. Dr. Melchiorre has been awarded a research sabbatical for the 2015-16 academic year, which will undoubtedly be much too short to get everything done.